What about the R68As? Those were the first cars for the MTA built by Kawasaki Yonkers, although the first cars from that plant were the PA4s. The R211s are the first cars to comply with the new Buy America standards (which have nothing to do with Trump, these were set in September 2016). As a result, only the mockup will be built in Japan. 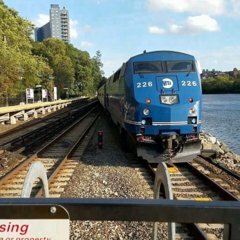 All cars, including the pilot trains, will be built in Lincoln/Yonkers. Is CAF currently qualified with NYCT? It's too early to tell, but Kawasaki isn't pulling out of the railcar business anytime soon. They still have the R211s, which guarantee work for at least the next 10 years. Does the screen look like this: This is version 3 but updated. ^ True, although some of these responses are insane. Who refuses to sit on the subway? That's just silly. I'm glad I'm not the only one who thinks that the r42's should be preserved as a "reserved" or " emergency " fleet once all r179's are in service. In fact, this is something that the MTA should do moving forward. In other words, subway cars should not be scrapped immediately after retirement. They should be preserved as an "emergency" fleet until the newer cars are running smoothly. That one at Bway Lafayette's been hidden then for ages. Those hanging signs are a lot more common in old Standard than you'd think. Feels like listing them is dooming them, but there are definitely a few dozen at various stations, particularly at the fronts and backs of platforms. Fewer and fewer, but the 8th Ave line in particular has them everywhere. I have a minor list somewhere. Not only do I think they'll be universal, especially with some of the Operators going from depot-to-depot, and driving different types of buses in each one, from the Commuter Coach buses to the Orions to the New Flyers to the Novas to the articulated buses, but I think they'll link the "key" to the specific Operator, just like how they're able to link an Operator's pass to the specific person. Express buses are known to layover on the highway. SI buses do it on the FDR. As for the QM1 situation you guys should reach out to the the transit reporters for local news agencies. Once it's on the media and people are outraged, the MTA will be forced to do something. PIX11 and NY1 both have decent transit reporters and AMNY loves transit news stories. The QM1 situation is mainly only know by those in the express bus community and that is a minority to the MTA. Once everyone knows and is pissed they are more likely to take action. I don't even get how some of the conversion cars still have like dirt smears and whatnot from the . It boggles my mind that they wouldn't have at least gotten a nice power wash or something in the process of moving them onto the . I had no idea that they still had one of these 80's signs at Broadway-Lafayette. The rest on the platform were all Helvetica. The bare minimum should be a subway line between Bay Ridge to Jackson Heights with B division loading gauge (with ability to convert to heavy FRA/LIRR standard later if desired). A train yard could be built at the 65th Street float yard, which is really the only space on the line big enough for a yard, although it's next to the water, which is one of my fears. Yesterday, I seen four R179s on the and one on the . I taken 3094 yesterday and I was pretty cold until I sat down and my initial thought was, "Yo, who was sitting here? They really burnt the whole seat!" Then I forgot that the seats were heated. Decomissioning Culver in favor of either a stub ending at the West End Line or more reverse branching is pretty insane though. ------- Super weird how they're using bits and pieces of the Bay Ridge Branch without actually engineering at the very least a Brooklyn shuttle from ENY to 62-New Utrecht. If you were to actually implement this plan there wouldn't be that many gaps left to fill in. I put in an appeal about six months ago. They said I did not graduate high school when I actually have a college degree. Today I received the judgement on my appeal. They accepted my college degree. Just waiting to find out my list number. They said they'd mail that to me later. Hope everyone else who appealed gets good news. Hey guys I just called. They’re up to list number 516 at the moment for final processing, and the next class is on February 11th. That’s only a few weeks away so I’m assuming any of us that have gone in for pre-employment in the last week or two might be waiting for the March class at the minimum. I’m in the LIRR group, and the seats and conditions are appalling. Eng needs to get it together. We created a culture where nobody wants to do that anymore. Tell kids for the first twenty years of their life that trades are dumb and they won't go into trades. ================================================================================================================================================= Part of the issue is that unemployment is at record lows, and driving a bus has more onerous requirements than other blue-collar work (customer service aspects, different licensing, etc.) In Seattle, where I am now, a major issue is that drivers here have a probationary training period where they get paid less. That same person could go to any construction site and get a high-paying blue-collar job on the spot. Why would anyone voluntarily take the worse job? Last 2 cars on Hudson Line not used for anything? From what i understand the power issues are on the Harlem Line north of NWP. While most of the reasoning behind closed cars, etc has already been answered, there's just a couple of points that haven't been touched upon. If there are cars full of people but the doors aren't opening.it's usually because the train is longer than the platform at the station. Example: Train 777. The 7:25 PM train from GCT to Croton Harmon is an 8 car train that happens to stop at Marble Hill. Marble Hill is only a 4 car platform. Because Metro North frowns upon doors opening up that aren't on the platform, only 4 cars of the train open. Another example of the same is every rush hour train north of Croton Harmon. In most cases the trains are 7 cars with a locomotive, the platforms are all 6 cars. As far as taking away cars during off peak times of day this would be a time consuming process. Any time a train is cut apart or cars added a complete mechanical inspection must be performed. If there was room to store a few extra pairs here and there this is what would have to happen. 8 car train goes into the yard to have a pair taken off because it's not needed for the next 4 or 5 hours. After a switching crew removes the pair. The remaining 6 cars have to have a complete inspection. This takes upwards of an hour. Now three hours later when the pair is needed again, and it's coupled back on to train to form a longer train, after the hitch is made another complete inspection must be done, taking up at least another hour. Because there aren't mechanical forces sitting around during the day to do this more would have to be hired. Another reason some trains having more trains than needed is due to maintenance cycles. Example of this is on the weekend, the 5:14 PM train from Southeast to GCT is 8 cars (and all 8 are often needed). At GCT that trains turns to the 7:20 PM train to Croton Harmon where in most cases only 6 cars are needed. Because Southeast only has toilet dumping capabilities on 2 tracks, the train goes to Croton where there are dumping capabilities on almost all the passenger yard tracks. Later that train may go back to GCT on using 4 cars, back to South east using 6 and layed over for the night where 8 cars will be needed again in the morning. It's easier to collect tickets in 6 cars that are each 80% full than 8 cars that are each 50% full.